Be patient, therefore, beloved, until the coming of the Lord. The farmer waits for the precious crop from the earth, being patient with it until it receives the early and the late rains. You also must be patient. Strengthen your hearts, for the coming of the Lord is near. Beloved, do not grumble against one another, so that you may not be judged. See, the Judge is standing at the doors! As an example of suffering and patience, beloved,take the prophets who spoke in the name of the Lord. Indeed we call blessed those who showed endurance. You have heard of the endurance of Job, and you have seen the purpose of the Lord, how the Lord is compassionate and merciful. Patience is a wonderful word, very hard and difficult to practice. Think about it. Patience, do I have patience? That’s something that we really need to meditate on. Today I’m going to reflect on patience. St. Theresa of Avila is a great saint of Spain. She said a wonderful thing. I want you to reflect on it. It’s a short poem, but very nice. Let nothing upset you. Let nothing frighten you. Everything is changing. God alone is changeless. Patience attains the goal. Who has God lacks nothing. God alone fills every need. How beautiful and how true that is. Just enjoy reflecting on her words. I do believe that patience attains the goal. That phrase really catches my eye. 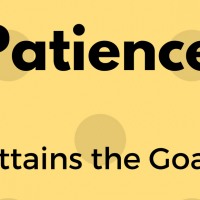 Patience attains the goal. I realized that without patience, we cannot attain any goal. Here, we’re talking about spiritual goals in our spiritual journey. If you don’t have patience, you cannot finish your spiritual journey. A spiritual journey is not just a few years, you work really hard, the next few years, you forget about it. A spiritual journey is not like that. A spiritual journey is, until you die, you keep pushing it. A spiritual journey without patience is impossible. We’ll just give up in the middle of it and how many people just give up in the middle of it? So if you live like this, that will only be a mediocre life. When we start something and then give up in the middle because it’s hard. Whether it’s a spiritual life or not, that life will become only mediocre. It’s not just your spiritual life, but this patience applies to everything in your life. Well to me, spiritual life is everything in life. I don’t distinguish between spiritual life and just life. Last Friday I had a premarital counseling with Sarah and Mike, and then we concluded our counseling, and then at the end, I asked him about his spiritual journey, and then Mike said this, “you know, to me being spiritual is living, and living is being spiritual.” And I said, wow. Profound statement. You learn very well in this church. Yes, being spiritual is everything about life. So patience also applies to your daily living. Without patience you can never be a good athlete. To be a good athlete, you have to have patience. You may have great abilities and skill, but only through patience the jewel of your great ability will be manifested. Without patience. You can never achieve the goal. How many times do athletes experience their limits? No matter how hard they try, they just cannot go beyond the limit that they are hitting all the time. How many times must they have been frustrated and wanted to give up in the middle of it. There are some athletes who go through slumps, but somehow another time, they just come out stronger than ever before. Why? Because they have the patience to go through that dark tunnel, that difficult time. But through patience they have overcome their limits and the jewel of their ability within them comes out. It applies to artists, too. Inspiration comes all of a sudden, you walk around, then all of a sudden you get an idea and you start drawing and painting or all of a sudden you get some inspiration and you write poems and beautiful ones come out. Yes, it is spontaneous. Yes. Often inspiration comes suddenly when you’re not prepared, but before it comes, you have to remember that there was painful waiting and struggle and many failures. Because you went through this dormant period, you can experience sudden inspiration. Inspiration doesn’t just come suddenly, but there is something you have prepared before that happens. In our relationships too, without patience, you can never build meaningful relationships. See in relationships, as you get to know each other, after a while you get tired and you see some limits. Of course, if the relationship is not worth it, ending it is an option, but to have any meaningful relationship, you have to go beyond the limits. So without patience, the relationship is not possible. Meaningful relationships are not possible. Next year we have seven weddings, and just this morning I got another wedding, so we have eight weddings from our congregation, just this congregation, so 2017 will be a year of parties, celebrations, and blessings. It’s great, but soon they will all learn how important it is to be patient to build a meaningful relationship. Mike and Sarah said, “wow, this is good. I didn’t know that all these things were involved in marriage counselling. I’m going to tell all those kids to take all of those premarital counseling courses and all that.” But there’s so much in marriage in addition to other relationships. Without patience, any meaningful relationship is not possible. And that is what the Bible teaches us today. He used the example of farmers and they know very well about the secret of patience, and this is what James said. The farmer waits for the precious crop from the earth, being patient with it until it receives the early and the late rains. They work hard, but at the end they have to wait patiently for the rain to come. It’s beyond their control. Life is like that, sometimes it’s beyond our control. Then we have to learn to wait with patience. Everything’s like that. To have precious crops, you need to be patient. To have precious things in your life. You have to be patient, you have your own timing, you cannot rush it, but you have to be patient. Then you’ll see the jewel of life in the end. Being a patient person is what we all should strive for. It is one of the greatest qualities that we have to build within us. I think you can learn other skills, but if you don’t learn how to be patient, I don’t think you can succeed in anything that you do. Patience is the greatest quality that we all must master. It is a skill, an art. The art of being patient, we have to learn how to master it, but being patient is not just keeping everything inside. Some people mistakenly think that being quiet and not saying anything is being patient. Wrong. Just because you’re quiet and just because you don’t say anything, that doesn’t mean that you’re patient. It may be a sign of being patient, but not always. I mean, you’re boiling inside, but just not expressing it outside? That’s not patience. Patience is an inner quality. Boiling inside already tells you that the equilibrium of inner peace is shaken and disturbed, so patience is not just keeping it inside and not expressing it. Patience is an inner quality. Well, what is that inner quality? The inner quality is peace and calmness. If you don’t have peace and calmness within you, you cannot be patient. To be patient you have to have this peace and calmness, so in that sense, I realized that patience is tremendous strength. It’s tremendous spirituality. Being always peaceful and calm. Only when you have that, then you can have patience. The real strength is not to fight back and attack. I don’t think that’s real strength. The real strength of a person is to have internal peace and calm. You can call it internal toughness to take whatever that comes to you. Someone said strength is the internal toughness to take whatever life deals out without losing your humanity. And he said, those who are ready to strike back at the slightest provocation are not strong but fragile. I think he said it well. There are always difficult people around you who test your patience. There are always difficult people around you who make you feel miserable, who make you feel small, who make you feel nothing but dirt. You know, there are always people who provoke you and there are always situations and circumstances that are ready to attack and throw you off balance. You will experience that all the time. We are living with provocation every day, every single day. We get provocation from the early morning. As soon as you get up and until you go sleep, you get provocation. As you drive in the morning, you’re already provoked by the way people drive these days. So whether you’re driving, or at work, or at home even, when you look at your children, you get provoked. You encounter situations where you feel so vulnerable, you lose patience. They test your patience very harshly. Patience is building the inner strength to deal with all these situations with peace and calm. Not indifference, but with peace and calm you can engage in it, so you have to continuously practice. It is a spiritual discipline. Every day you experience a situation where you’re provoked, that’s a situation where you need to build up your muscle of patience. Instead of just being provoked and letting it out, you have to learn how to be patient in that situation. As you keep doing that, you learn how to be patient. It is a discipline. It is something that you need to practice every single day. But let me tell you, patience does not make you incapable of being angry with injustice. Let me say it again. Patience does not make you incapable of being angry with injustice. Patience does not make the anger consume you. You may be angry with injustice, but you don’t let the anger consume you. Patience gives you the strength to fight injustice around you. Gandhi was campaigning for the rights of Indians in South Africa when he was young. He came one day before the Governor General Jan Smuts, and then he told him very quietly. He said, I want you to know that I intend to fight against your government, and Smuts laughed. You have come here to tell me that? And is there anything more you want to say? Yes, said, Gandhi, I’m going to win. Smuts sarcastically asked him, how are you going to do that? And Gandhi smiled, with your help. Years later, Smuts said, that was exactly what Gandhi did, and I did exactly what Gandhi said. You know those sandals, Gandhi made that those sandals and gave them to Smuts in 1914. In 1939 at the 70th birthday of Gandhi, Smuts brought these sandals and said this, I have worn these sandals for many summers since then, even though I may feel that I am not worthy to sit in the shoes of so great a man. Gandhi won the respect and the friendship of the General. Patience is not just being patient with injustice. It does not make you incapable of being angry with injustice, but instead of being consumed by the anger, you turn it into a real fight and you will win it. That’s patience. Somebody tries to make you hate them, instead of responding to them with hate, you can continuously love them. That’s patience. That is the kind of patience I’m talking about and that is the kind of patience Jesus showed us. To the cross he was patient, but it was clear where he was going. You have dreams, visions, I hope that you have strong patience. Ultimately you will win when you have that patience. Today’s the first Sunday of advent. Advent is a time waiting for the coming of our Lord Jesus Christ, as we wait for the coming of our Lord Jesus Christ, let us wait with patience. This is what James teaches us in today’s scripture. Be patient, therefore beloved, until the coming of the Lord, you have done well so far, keep persevering, be patient and do what you dream about in life. Only patience can give you that.